Vocation vs. Avocation – What’s the Difference? 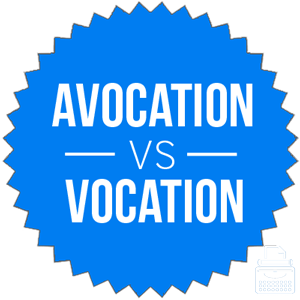 Home » Vocation vs. Avocation – What’s the Difference? Most people have both a job and a hobby. An attorney might enjoy gambling online, for example, or an auto mechanic might enjoy getting drunk and playing golf for charity. Both online gambling and drunken golfing are more accurately described as hobbies than careers, even though in these scenarios, both might potentially raise money. There is a similar difference between the words avocation and vocation. One represents a primary career, while the other denotes a hobby. What is the Difference Between Vocation and Avocation? In this post, I will compare vocation vs. avocation. I will use each of these words in at least one example sentence, so you can see how they appear in context. Plus, I will show you a memory tool that makes choosing either vocation or avocation much easier for your own writing. What does avocation mean? Avocation is a noun. An avocation is a hobby or minor occupation. Many people enjoy cooking, but most people do not cook professionally, so for them, cooking is an avocation. Similarly, many people garden, but most are not professional gardeners, so for those people, gardening is an avocation. On her online dating profile, under “hobbies or other interests,” Esmerelda listed “smashing the patriarchy” as an avocation. One of the most effective ways to avoid becoming burned out at work is to develop an enjoyable avocation that helps you deal with stress. What does vocation mean? Vocation, meanwhile, refers to a primary occupation or job. Professional welders weld as part of their vocation. Machinists work in machine shops as their vocation. When he was in 12th grade, Jeremy took a career self-assessment test, and the results indicated that he would be well-suited for a job as a go-kart mechanic or a bookbinder. Many Americans spend time looking for a vocation they will enjoy, while many others spend time avoiding a job they do not enjoy. Both vocation and avocation derive from Latin terms that are no longer in use. Both have been part of English for several centuries. Vocation means primary job, but to say vocation instead of job implies passion for the work itself, for more abstract reasons than monetary gain or social standing. A person who spends his or her entire life working to save endangered species might do so out of passion, rather than a desire for a stable, easy career. Given their spellings, one might think that these words are opposites of each other, but that is not quite the case. A vocation is a job that one often pursues out of passion. An avocation is a secondary job that someone pursues for pleasure. Avocation vs. Vocation Check: Since avocation starts with A, like amuse, it should be simple to remember that an avocation is a hobby pursued for enjoyment or amusement. Is it avocation or vocation? The terms are not interchangeable, so you will have to remember which is which. A vocation is a job or primary career. An avocation is a secondary job or hobby often pursued for pleasure. 1 What is the Difference Between Vocation and Avocation? Spread or Spreaded – Is Spreaded a Word? Wack or Whack – Which is Correct?